“I’d like to thank all of the people in Kuala Lumpur for recently inviting me to speak at the Global Transformation Forum 2017. This forum is indeed a model and blueprint for other nations to attempt to duplicate. “The list of speakers at the forum included some of the biggest names in business, technology and sports, but the most important people that I met during my visit were the people of Malaysia! The people who live, work and are Malaysians! “At this point in my life, I’ve been blessed to have visited and spoken in 80 countries and I can say with no hesitation that the warmth, spirit and hospitality of the Malaysian people is beyond anything that I’ve ever expe­rienced anywhere on the planet. “I was particularly impressed with the energy, passion and drive that I saw reflected in the faces of young Malaysians. “It excites me to meet and interact with people who will soon be leaders not just of Malaysia or South-East Asia but of the world. “One of the things many people that I interacted with had shared with me was their ‘feelings of fear’ as a result of so many recent political developments and world events. “My response was and is simple; in this times of tension, anger, negativity, hostility and indeed hatred, this is the time to be like a candle in a cave. “If you’re about anything that is positive, enlightening or empowering, your work has just become more important than ever. “And as you stand there as a candle in a cave, others will be drawn to your light. And the first one to come and stand next to you will be me! GROWING up in Wajir, which is about 440km from Kenya’s capital city of Nairobi, Jamila Abass had a dear teacher who was blind. “I wished to become a doctor then because I wanted to help restore his sight,” she recalled. She attended a medical course in Morocco, but later opted for computer science when she was told that there would be just one scholarship for students in her class to pursue medicine. Now 33, the Kenyan has become a problem solver of sorts. The computer scientist and social entrepeneur calls herself an “accidental computer scientist”. She invented M-Farm, a mobile app powered by text messages providing real-time crop market prices and contacts to farmers in Kenya. It also offers a group-selling tool, which enables farmers to get together and take their produce to certain drop-off points. This would enable the farmers to connect directly with buyers, allowing them to make profits. “The media in Kenya always talked about how farmers are being ripped off by middlemen,” she said in an interview after attending the Global Transformation Forum in Kuala Lumpur last month. The forum was a platform for influential leaders to share their experiences on how to drive transformation. Jamila was a panel speaker during a session on “Transforming the Future of Business”. According to her, many smallholders in Kenya had the produce but no means to market them. As for the farmers, she said they had to rely on middlemen, causing them to lose out on the profits. “There was a huge disconnect between markets and farmers. We wanted to close that information gap between them,” said Jamila. In 2010, together with an associate, Jamila drew up M-Farm. “I came from a humble beginning. When we talk about people at the bottom of the pyramid, I’m not just talking about it. I’m talking from experience,” said Jamila, who as a child helped to tend her family-owned stalls. She said it was important to help farmers, who made up 80% of the rural population in Kenya. “The app was built to create a connection between farmers and buyers, ultimately reducing the obstacles between them. “When there are middlemen involved in a buying transaction, the money that goes into the farmer’s pocket is less,” she said. With the M-Farm app, she hoped to change how rural Kenyans conduct their farming business. “This can help increase the number of people being taken out of poverty,” she added. Jamila cited previous cases in which other people came forward, wanting to help the farmers with their projects, but which eventually fell through. This left the farmers high and dry, and sceptical. To gain the farmers’ trust in M-Farm, Jamila approached the farming community’s leaders and groups, using word of mouth to spread the message. Even former US president Barack Obama, when he visited Kenya in 2015, was all praise for M-Farm. Jamila is indeed serious about helping the farmers. “A future without farmers spells disaster for the world’s food security,” she said. Jamila said consumer trends showed that people were going back to organic produce, something that these farmers had the expertise to yield. Among the women in Wajir – where a Unicef study has put school enrolment of girls at only 13.9% – Jamila is a role model. She is also one of the 2015 New African Women of The Year and Forbes 10 Female Tech Founders to Watch. Asked whether she would encourage other women to venture into science as she did, she said women should “do whatever they choose to do”. “If a woman feels that she is better in business than science, then she should be given that freedom of choice,” she added. She also credited her brothers for having vigorously fought for her right to be educated. “I only started attending secular school when I was almost eight, the same time as my younger brother, who was three years younger than me. I call myself accidentally educated,” she said, laughing. In 2010, Jamila Abass came up with M-Farm, an app that connected Kenya’s small-time farmers with the market they were dealing with, bypassing middlemen and helping farmers to get the profits they needed. We interviewed her during this year’s Global Transformation Forum in Malaysia, to find out how she came up with the idea, the power of the small-time farmer, and the role of women in today’s world. THE applause dies down and a palpable silence falls as all eyes follow the trail of the spotlight in the darkened hall. A diminutive figure in a wheelchair is slowly pushed to the centre of the stage where a lone grand piano stands. 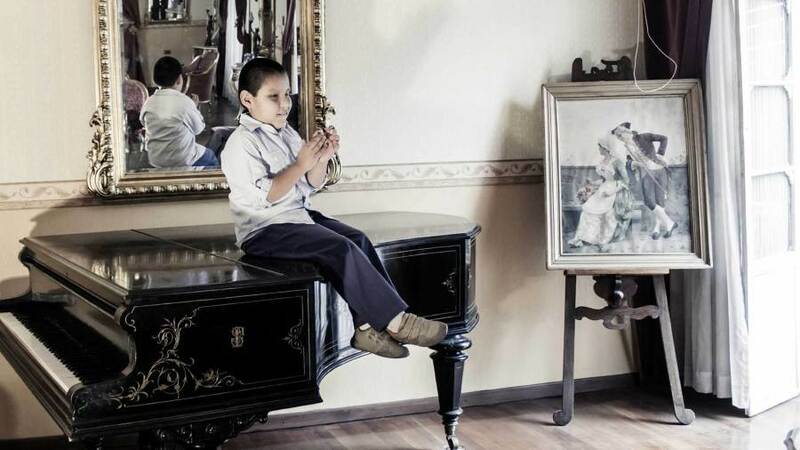 Guided to the piano bench, he seats himself quickly while eager hands immediately reach out to touch the musical instrument without any hesitation. He’s impatient to perform. Like greeting an old friend, his fingers find the ivories and the 3,000-strong spectators are swiftly transported into his world where music rules and everything else is eclipsed in its wake – including the ubiquitous wheelchair which transported him on stage and the fact that this incredibly talented musician is blind. Welcome to the world of Jose Andre Montano Baina. 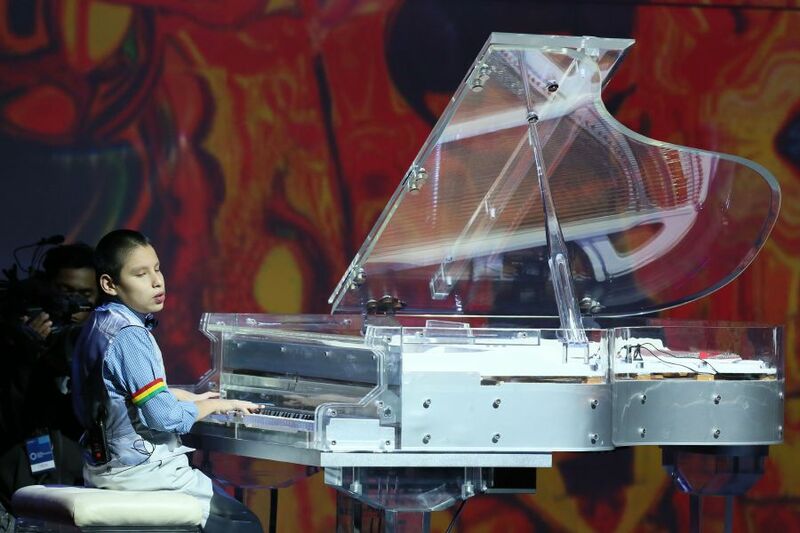 The 12-year-old jazz prodigy and Bolivia’s finest rising star was here recently to perform at the Kuala Lumpur Convention Centre for the Global Transformation Forum. Playing a selection of jazz melodies comprising his own compositions and his interpretations of jazz favourites, Jose, or fondly known as Josecito by his family and friends, has been wowing audiences all over the world since he was 5. Performing at the Kennedy Centre for the Performing Arts in the US in honour of Pope Francis’ visit to the nation’s capital. He asks for my name first. Repeating it to himself, he’s careful to address me by my name and takes care to pronounce it properly. Then with all the curiosity of a precocious 12-year-old, he interviews me before I can even begin to ask him questions. “What do you write about? What paper do you write for?” he asks and I explain to him, hemming and hawing because I’ve never had to explain that to anyone before. “Oh that’s good!” he responds with genuine interest, despite my awkward explanations. 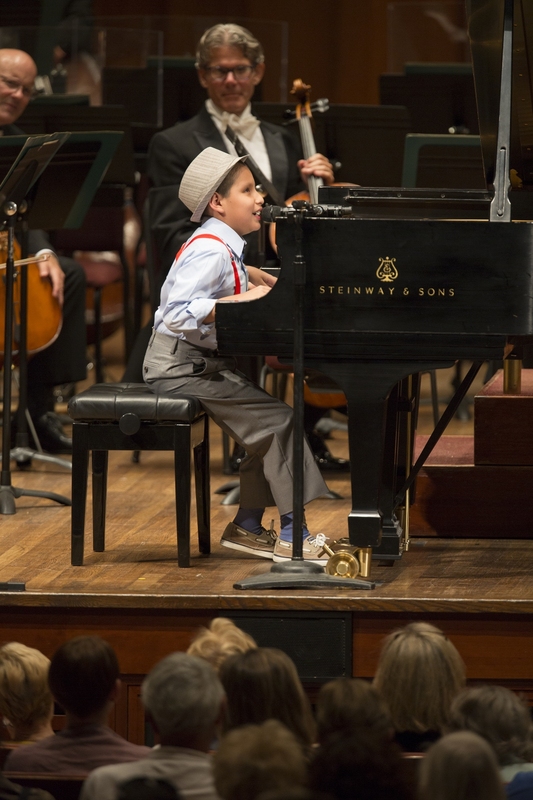 He initially picked up the drums at an early age, but quickly moved on to the piano with remarkable ease. “I like a lot of instruments like the drums, bass and the guitar, but I like the piano more because it’s a beautiful instrument that can transmit what I feel. “And the noise is beautiful… it really touches my heart,” he explains, his face lighting up as he describes his favourite instrument. Rattling off luminary jazz pianists such as Michel Camilo, Herbie Hancock, Keith Jarret, Chick Corea and Oscar Peterson as his inspiration, it’s clear that Jose is an old soul with a taste for jazz. “But I do like everything else – blues, tango, bolero even heavy metal!” he says, grinning. The child prodigy is able to play anything with ease and style, which adds to his rather impressive resume – something many seasoned musician would spend a lifetime acquiring. Wowing audience during the recent Global Transformation Forum at the Kuala Lumpur Convention Centre. Born in Cochabamba, Bolivia, Jose taught himself how to play the piano at an age when most children were barely grasping the alphabets. In an interview in 2012, his father Roberto Montano said: “I didn’t know jazz before, he got me into it. It’s as if he was born with a jazz chip inside him. I don’t know how to explain how it came about. It’s easy to forget that Jose is only a child. He is articulate, speaks three languages and he rarely needs any help in parrying with journalists like myself. However, his parents are there keeping a protective eye – a reminder that he’s only a child – but nevertheless, one with such an incredible talent that has got him playing and wowing audiences at some of the top venues in Bolivia and around the world. Yet there is the fact that he has a disability and Jose is candid about it. There was nary a dry eye during his performance at the Kuala Lumpur Conventional Centre moments before my interview with him. 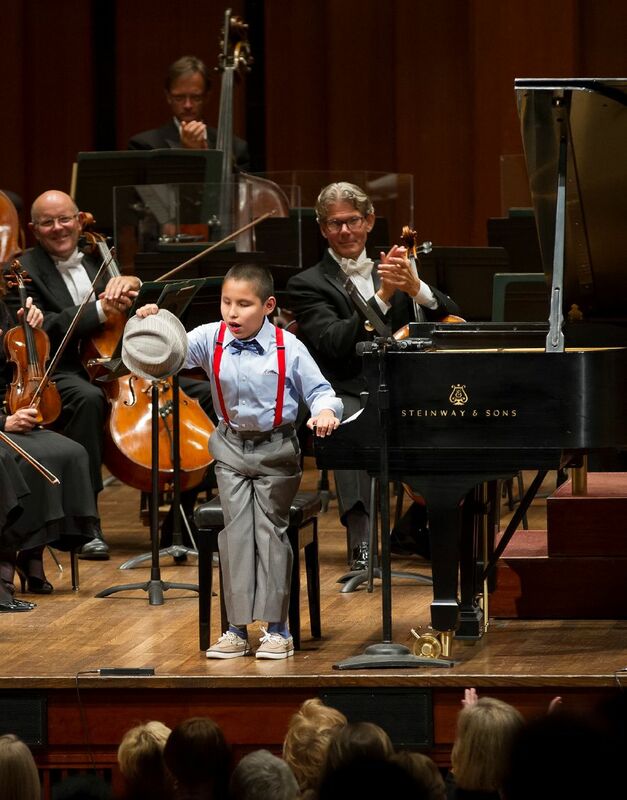 Jose Andre Montano has been playing the piano since he was 3. It is that dream that has gotten Jose traversing the world and playing to appreciative audiences all around. “I first started playing on stage at 5. I’ve always wanted to play for people from the time I was three years old. I always dreamt of being on stage!” he confides. Still, it is when he’s at the piano that Jose has found his own little perfect rhythm. “I’m happiest when I’m playing. The music that comes out takes my breath away,” he confides. Jose does best what is he is born to do – opening our eyes to his brand of joyous music played in his own inimitable style. It’s easy to recognise that “vast potential” watching him perform at the Kuala Lumpur Convention Centre. The entirety of his performance encapsulated within his head bursts forth in jazz improvisations and original compositions that have his hands fluttering across the keyboard in jaw-dropping virtuosity. And the audience couldn’t have enough of it. He was more than happy to play an encore after receiving a standing ovation. “Music is good for me,” he confides in me later. I promise him I will. Bolt – full name Usain St Leo Bolt – has just stepped off the stage at the Global Transformation Forum 2017, where he electrified an audience of some 3,000 with an inspiring tale of how a cricket-loving Jamaican boy became a sprinter who blazed across the finishing line at a World Record of 9.58s for the 100m in Berlin in 2009. Somewhere in the vast KL Convention Centre, where the forum was being held, were tote bags with the caption “I caught up with Bolt” emblazoned across them. He doesn’t try to evade questions, not even when he was being needled by CNN’s international business correspondent and presenter Richard Quest during his hour-long Transformative Masterclass session on stage and not when he was taking my queries. By the time the other reporters came in, Bolt had already talked about his retirement plans (he wants to focus on his charity work in Jamaica and his business), given tips on running (core strengthening is important), mused about football (he’s hoping to work something out with Manchester United) and taken a few rounds of selfies. And cue that famous pose, which he gamely struck up for the cameras, not once but twice to the great delight of the audience and the burst of photography flashes in the packed plenary hall. The 30-year-old answered all of the questions – he must have answered the same questions at least a dozen times, put to him by a dozen different reporters in the past month alone – with his trademark grin. To say the audience was awestruck by Bolt’s presence – the holder of both the 100m and 200m world records as well as that for the 4×100m relay – is an understatement. Another member of the audience gushed that he had “19 questions ready” for him. However, the one thing that Bolt continues to stress upon, the single thing that he will have me remember during the interview, is how hard he has worked for his success. “A lot of people see it (and) a lot of times, oh, they think ‘I can do this’. Yeah, you can do this but it’s not easy to get to the top or to be the best. So, it’s the work you put in. “You have to understand they (athletes) have to work hard, have to be very dedicated (with) a lot of sacrifice also,” he had told Quest earlier. It’s a reply he stuck to despite Quest disagreeing, showing the audience a clip on the giant screen of his “party animal” ways. “Track and field is intense. Everytime it gets overwhelming, I go party,” Bolt pointed out, though, not too seriously and again, flashing that wide smile. Bolt, it seems, is as famous for his partying as much as the hard work he espouses. But, really, who can forget the Internet memes generated from that semi-final run during last year’s 100m dash at the Rio Olympics, which he completed, grinning, in 9.89s? Or the ease by which he gamboled across the finishing line, leaving his rivals in his wake? Bolt said he only made it look that easy because he had trained hard for nine to 10 months for that one moment. Hard work is the one lesson that he has had to learn the tough way, so to speak. Earlier on, Bolt shared with the audience how he initially thought that his time from running during High School was going to carry him through when he turned professional. Instead, things got difficult, a period he has described as the “lowest point of his career”. On top of the negativity he encountered about being a “one-hit wonder”, it took him, Bolt said, four years to realise that he needed to get down to the task of serious training, hard work and discipline. “It took me a while but I woke up,” he confessed, adding that he then had to play catch up as everyone was ahead of him. It’s a lesson that Bolt has since taken to heart, setting goals for himself to achieve throughout his running career although the first one that he did was prosaic enough. He has only wanted to buy a washing machine for his mother – “I’m a Momma’s boy”, he told the audience sheepishly – and a car for his cricket-loving father. A few washing machines later, Bolt is still setting goals for himself, albeit a lot grander. “The one thing I do is set goals for myself. I always tell people that’s the simplest thing you can do. If I go into football, I probably say, all right, I want to score 20 goals this season (and) depending on what (position) I play, I want to do this amount of assists. It’s an advice that he continues to push, even when I confronted him – though confront is hardly the word I would use with a man almost double my height – about the state of Malaysian athletics, especially in track and field where Jamaica is one of the standard bearers, and whether the Malaysian government is doing enough. “I definitely think that what sports you (Malaysia) focus on the most (is where) you produce more athletes,” he said, adding that both personal efforts and government aid helped in the development of world-class athletes. However, Bolt warns against pinning it all on the Malaysian government – or any other government, for that matter – to see any improvement in the country’s performance on the world stage like the Olympics. “Because you (athletes) can always do so much your own way. Because when I was coming through, we didn’t have a lot of (government) help. “But I wanted to do this and be great. So, I worked,” said Bolt, who earlier reeled off Pele, Maradona, Muhammad Ali and Michael Jordan as among the sporting greats he looks up to. “Sometimes, it’s the attitude of the athletes that made it. It’s definitely not the facilities or whatever it is. Sometimes, a lot of the athletes may not have gotten the facilities but they want it more than life,” he said, citing Kenyan javelin thrower Julius Yego, who learned the sport from watching YouTube videos, as an example. Yego went on to win the silver medal at the Rio Olympics. Similarly, he cautions against cranking too much heat on local athletes to perform, saying that he has seen too many falling by the wayside due to pressure. “A lot of athletes can’t handle pressure…I’ve seen a few athletes who have succumbed and it’s the pressure that the country’s (sports) confederation put on them to do great that has really caused them to fall by the wayside. “Because that athlete may not be capable of dealing with that pressure and then, (you’re) going to lose that athlete that could have gone and done great things,” he said, adding that it was also not right to exert that kind of stress on athletes, particularly when they are at a young age. Bolt has his own way of dealing with the pressure, he reveals to Quest; he lets his mind dwell on trivial matters during that pivotal moment at the starting block and, probably because he now trains so hard, he does not want to think about his competitors or stress about events he has no control over. When Quest pointed out that “clearly, it’s working very well for him”, Bolt added: “But you’ve prepared all you can already. “There’s nothing you can do now at that moment. You’ve trained nine or 10 months for that moment. All you can do is run and compete. “When I get to the (starting) line, I’m confident that I’m going to win at all times, no matter what’s going on. Even if I end up losing, I’m still confident that I’m going to win,” he said with a laugh. The one time that he didn’t train or prepare all he could due to an earlier knee injury – and as a consequence, his confidence took a stumble – was when Bolt crashed out from the World Championships in Helsinki in 2004, which, to this day, he never has a conversation with his coach about and still finds it shocking. I asked him if there is anyone who can beat Usain Bolt – him, with brimming confidence, positive thinking and old-fashioned hard work. Q: Is this your first time in Malaysia? A: This is my first time. Q: And what do you think of it so far? A: It’s good. I’ve been thinking of it for a long while and I’ve been wanting to come for a vacation. After this, after the season, I’ll definitely come back. Q: How has Jamaica produced so many Olympics champions like you? How come Malaysia could not do it? A: I think it’s all about what sports you pay attention to over the years. When you started off, you used to pay a lot of attention on football. Football’s big. Then, I think over time (as) track and field got bigger and then (there is) more focus on track and field. I definitely think what sports you focus on the most (is where) that you produce more athletes. I think as Malaysia focus more on track and field and over time, Malaysia will start to produce more athletes. Q: Do you think this is more due to personal efforts or government funding for development? A: Well, I think it’s both. Because starting off, we didn’t have a lot of money in Jamaica but we produced athletes. When we got to a certain level, (we) definitely needed the government to step in and help but we started by ourselves. But (there) comes a time when you’ll definitely need government support. Q: What’s the most inspiring thing you could tell all the boys and girls in Malaysia who want to be like you? A:It’s determination, you know, and to enjoy what you do. Always enjoy what you do. Just work hard and to be honest, it’s not an easy role. It’s never easy but just be determined and focused and work towards your vision. Q: Do you think there’s anyone who can beat Usain Bolt? A: I definitely want to say no (laughs). But like my Ma say, anything’s possible. You never know who’s going to show up next. For me, personally, I didn’t want it to go but hopefully, for the sport, it will. Q: You’ve revitalised interest in the track and field? Do you feel that there’ll be someone like you again? A: Oh, there won’t be anyone like me, that’s for sure. But I think the possibility of athletes stepping up, there’s a possibility. But like I said, it’s about how much they want it, as much as I wanted it. Because I really wanted it. So, the question is do they want to be as great as me or even greater than me. A: Yeah, I’d love to. That’s something I love. Hopefully, I’ll get to work something out. Q: How soon can we see you on the (football) field? A: I’m going to get a trial run with Borussia Dortmund. I’ve been invited to spend a couple of days and train with them. So from there, then we’ll decide if I’m at that level or if I want to take it on from there. Personally, I want to but we’ll see how it goes. Q: What tips would you have for people who want to run? Tips for speed? A: To me, it’s all about technique and strength. I think core strengthening is one of the most important thing and then, come technique. Those two are the important things if you’re a runner and you want to improve on anything. Q: Would you have done something out of sports if you haven’t been a runner? A: I was always into sports, I think, from the start. My Dad got me into cricket, then got me into running. So, for me, all I knew when I was growing up was sports. Q: Would you consider a career in politics (after retirement)? Q: You’re known for your trademark smile. Is there anything secret behind it? A: (laughs). No, it’s just me. The first idea – coming off is trying to be me (and) showing the world who I am. Q: You seem like a laidback person, compared to how fast you run. Does your laidback personality kind of help you in your running? A: For me, it comes to me in relaxing before a race. Because that’s all I am. So, it takes for me to relax and not get tense when the races are about to start. Q: How can you not get carried away by the wealth and the money you’ve won? A: I just work for what I want. I just have a simple life. All I like to do is to party. That’s who I am. I’m just a simple person who really enjoy life and work for what I want. Q: What about the future? Do you think we will fear the next wave of Jamaican sprinters? A: (laughs) I think we definitely have a lot of talent. I think a lot of times, a lot of athletes lost on motivation. I’ve seen a lot of talent that I thought was going to be good and then, at the end of the day, they kind of faded away. So, I feel – I’ve tried this a lot -, it’s not easy. You shouldn’t be satisfied with just making the Olympics or the Jamaican team because a lot of athletes (when they do) feel like, woah, they’ve done good. Continue to struggle for bigger and better things, continue making goals. It’s all about the determination of the athletes but definitely, there’s a lot of talent there. Q: Is there anything we can do to convince you to stay for the next Olympics? A: (laughs) There’s nothing left. It’s too far. Maybe in the next two years, I’ll say four more years. Q: Are you bored with the sport? A: Yes, the motivation is not there. I enjoy watching (the) sport. (It’s) not because I don’t like the sport, (it’s) because I’ve done what I’ve wanted. This was my aim – to win (at) the three Olympics and I’ve achieved the ultimate aim. So, I need to find something fresh and new that I really want. THE buzzword that kept everyone excited at the recent Global Transformation Forum (GTF) 2017 was “Jack Ma”. The 1.5m tall Alibaba founder and executive chairman was clearly the main draw at the two-day event in Kuala Lumpur, with the who’s who of Malaysian industries glued to their seats in anticipation of what he had to say. Many might dwarf Ma physically, but they were all in awe of f China’s e-commerce giant, murmuring in agreement and astonishment throughout his talk. Ma, 52, set up Alibaba, a Chinese e-commerce company, in his apartment in Hangzhou, Zhejiang province, with 18 other friends in 1999. Today, Alibaba Group generates an annual gross merchandise volume (GMV) of US$580bil (RM2.5tril) – placing it at the 21st position on the list of countries by GDP – with a goal of achieving one trillion dollars by 2020. Clad in a simple white shirt with sleeves folded up to his elbow at the hour-long talk, the charismatic figure was very humble about his success, stressing that he was not the brightest, and had made mistakes and failed many times. “I spent seven years in primary school while normal students took five years. I applied three times to get into university. I applied for 30 jobs but did not get one. “When I tried to look for a job at KFC, 24 people went and 23 were hired. I was the only one who was not accepted. I also tried to be a policeman. Five classmates went and four were accepted, I was turned down,” he said. But Ma said it was the rejection and failure that made him who he is today. “Every setback, every time people refuse us, I take that as a training course,” he said. During his talk, Ma constantly stressed the importance of having a good team and the need to groom and train talents within an organisation to ensure the success of a company. And just like his speech at the launch of Malaysia’s Digital Free Trade Zone (DFTZ) a day earlier alongside Prime Minister Datuk Seri Najib Tun Razak, Ma emphasised on his notion of elevating small and medium enterprises (SMEs) and young people to greater heights using technology. Likening e-commerce to mere “dessert” for developed countries like the United States, Ma said it was the “main course” in China, where infrastructure for traditional retail lagged far behind, leaving much room for a new form of retail to emerge. While the IT era gave birth to IBM, Sisco and the like in the West, Ma said Asia could ride on DT through mobile technology and machine learning. Cautioning that machines can be smarter and more powerful than people, Ma said a lot of jobs would be replaced. But that being said, a human being can always trump a machine with culture and values, so his advice is to change the way we teach our children. “Education should focus on imagination, creativity and teamwork. We should teach them music, sports. Sports make kids understand what is teamwork, music and painting make kids understand what is imagination and creativity. “I believe the future is not about competition of knowledge, but wisdom and experience,” he said. Ma described successful entrepreneurs like Malaysian tycoon Robert Kuok and Hong Kong business magnate Li Ka-shing as “social scientist plus artist”. “You have to understand human beings, their behaviours and needs. You should be very artistic,” he said. Ma’s English was fluent as he gave an articulate account of his experiences and opinions. He won “cookie points” when he publicly applauded women for their indispensable role in the workforce for their caring nature. In Alibaba, he said, close to half of the employees are female, who also represent 33% of senior management. More than half of the sellers on Alibaba’s online shopping sites are also women. In November last year, Ma was named the digital economic adviser to the Malaysian Government when he met Najib in Beijing for the second time. The first was in 2014. Ma said he did not expect to draw a salary from this role but saw the appointment as an honour. Tan Sri Ong Ka Ting, the Prime Minister’s special envoy to China who received Ma at the airport on Tuesday, found Ma to be friendly and humble despite his phenomenal success. “He carries no airs. He acknowledges everyone watching him, including the airport staff and police officers, with a wave and a smile,” Ong said. It was Ma’s first time in Kuala Lumpur after a visit to Langkawi some time back, and he seemed impressed with the capital city. He told guests at the DFTZ launch that he was inspired by Malaysia’s Multimedia Super Corridor in 1996 when he was building his Internet business. “It made me think … hmm, that country has a great idea about the digital world,” he said. Najib was noticeably relaxed and jovial at the launch event, in contrast to his seriousness at the GTF that morning. To create a casual vibe that is the “cool” thing of IT business, both of them were not wearing ties – at Ma’s suggestion, according to Ong. “Najib and Ma seemed to have very good chemistry. They share similar points of view on inclusivity, assisting SMEs, and improving GDP,” Ong explained on how the two hit it off. At the GTF talk, Ma said he was happy to see young faces in the crowd, advising them to design their own future and focus on the double H: health and happiness. The question of retirement also inevitably cropped up. For someone who lives a hectic life and spent 800 hours in air travel last year, Ma said he dreams of “retiring and dying” on a beach, and not in the office. “Life is not only about Alibaba. There are so many interesting things that I don’t have time to enjoy, so I will never go back to the company and criticise the young people like a stepfather,” he said. Perhaps, we might get to see Ma getting a tan on the lovely tropical beaches in Malaysia when he decides to call it a day! JACK Ma’s life is very much a testament to the idea that nothing is impossible. At least that’s what he still believes in. A former English teacher and now one of China’s richest men (with a fortune worth around US$30 billion), the executive chairman of Alibaba Group has built his company into a major force in China’s e-commerce. With a market capitalisation of US$264 billion and which counts some 450 million customers a year, the company is now taking the world by storm by going beyond China. Emerging as a global icon for Chinese business, he travels widely around the world, meeting government leaders and business people and sharing his business philosophies and his rags-to-riches story with varied audiences. He dropped by in Kuala Lumpur last week, sharing the same stage with Prime Minister Datuk Seri Najib Razak, concluding a deal to develop an e-commerce hub near Kuala Lumpur International Airport and delivering a lecture at a global transformation forum. The digital economy adviser to the Malaysian government spoke of how he was impressed by the speed in which Malaysia’s Digital Free Trade Zone (DFTZ) was set up. “Malaysia is very business-friendly and much more efficient than I thought,” he said. Ma said it took only 10 minutes for him and Najib to agree on introducing the DFTZ when they met in China last November. “My team and I thought — is four months possible? We have been discussing it with many European and Asean countries,” he said. A firm believer in globalisation, the 52-year-old Ma said with China’s Silk Road — which he referred to as the “first globalisation” — the export of China’s tea leaves was possible as they were placed in containers made of tin sourced from Malaysia. The high-profile Alibaba chairman sees his stature as a global business leader as an obligation. We Malaysians can learn many things from Ma and his business ways. But we may also find it strange that his company, an Internet-driven conglomerate, bought into Hong Kong’s English-language South China Morning Post newspaper in 2015. Ma has explained his million-dollar investment in SCMP as ensuring that non-Chinese speakers have access to high-quality information about China. What are the main things we can learn from Ma? To me, one of the things is that a good command of English is important. Ma has shared in his numerous TV interviews or public talks on how he went out of his way while growing up in Hangzhou, China, to pick up English by listening to the radio or talking to foreign tourists. “Since there was no way to learn English at the time — there were no teachers in our city who could teach English — so I listened to the BBC and Voice of America, and there every evening, 8 o’ clock to 9 o’ clock, I opened my radio and every Monday, Wednesday and Friday, I listened to VOA and the first book I heard about was The Adventures of Tom Sawyer,” he said. Another trait of his is to learn to think differently. “For nine years every morning, whether snow, rain, or sun, I went there looking for foreign tourists to become a free guide and I made a lot of friends. Fortune magazine, in its coming April 1, 2017, issue, has written a piece headlined “You don’t know Jack”. It discusses the three precepts which are key to Ma’s approach. Alibaba is a platform, not a retailer. It holds no inventory and a 47 per cent stake in a logistics network rather than owning trucks and warehouses directly. Like President Xi Jinping of China, Ma promotes the virtues of global trade — all the better if small businesses sell their wares on Alibaba’s platforms. Ma says he’s been thinking about his departure from the company he built since he was 45, seven years ago. But it’s probably still not imminent. Perhaps, another key lesson from Ma for Malaysian businessmen is that you can become rich, but not at the expense of the environment. While you could find almost all products on Alibaba, you will not find ivory, shark fin and sea turtles from the listings. After learning how shark fins were harvested, Ma made it a point to stop eating the stuff. SHAH ALAM: Datuk Seri Abdul Rahman Dahlan has advised Malaysians against making attempts to undermine the country’s economy by spreading negative or false information. The Minister in the Prime Minister’s Department said such actions do not only affect the government, but average Malaysians. He said when people talk on social media, for example, about Tabung Haji and the Employees Provident Fund (EPF) going bankrupt, it reflects badly on the country’s economy on the world stage. “Before giant global companies like Saudi Aramco, for instance, invest in a country, they will look at (the risks of investing). “If our country’s risk is high, these companies will not invest with us – and imagine how many jobs will be lost. “Our discussion with Saudi Aramco on the Refinery and Petrochemical Integrated Development (Rapid) project in Johor took two long years because of this. They were worried about our economy,” he said in his speech at the 3rd Chartered Financial Analyst (CFA) annual summit today. The summit, attended by students from various public tertiary institutions and young professionals, was co-organised by Yayasan Peneraju Pendidikan Bumiputera and UiTM’s Faculty of Computer and Mathematical Sciences. KUALA LUMPUR: Jazz prodigy Jose Andre Montano is not your typical rock star – he is blind and just turned 12 on Monday. The Bolivia-born musician and composer carries a simple message via his music. “My message to the world is that there be no more wars, but peace. “Never stop dreaming, because you have the right to dream. You can achieve it by wishing from the bottom of your heart,” he said in an interview on Thursday after he enthralled the audience at the Global Transformation Forum 2017 when he took to the stage to perform a musical recital and spread his message of peace. “One day I was having lunch with my dad and I asked him why people wanted to take pictures with me and why reporters wanted to interview me,” he told the audience during his 15-minute performance. He said that his father then told him somethingfor the first time. However, Montano’s father was determined that his son would do well. “Here I am now. I’ve performed in several cities and now I’m here in Malaysia. I enjoy life,” he said. His moving rendition at the GTF 2017 saw motivational speaker Chris Gardner coming up onstage at the end and giving Montano a big hug. During the interview later, Montana said he discovered music when he was three-and-a-half-years-old and self-taught himself to play the piano. By the time he was six, Montano had already formed his first Latin jazz band and released his first album, Ama a Todos (Love Everybody), two years later. “I chose jazz because it makes me feel happy when I listen to it and it gives me a lot of feelings. I love it,” said Montano, who also enjoys the blues, rock, tango, and bolero. His musical influences include jazz pianists like Art Tatum, Oscar Peterson, Chick Corea, Michel Camilo, and Herbie Hancock. “I’m planning for another album which will be out in May in the US,” said Montano, who lives in Washington DC with his parents. Known for his improvisation techniques and expressive music, Montano has shared the stage with jazz musicians from Bolivia, Brazil, Mexico, Peru and the United States. While tickling the ivories is his greatest passion, Montano also enjoys playing video games and kicking a ball around the park as much as any 12-year-old. “I also like playing on my computer, my iPad, going to the theatre, playing football, and having pizza with my friends,” he said. In a press conference on March 24, Alibaba Group founder and business magnate Jack Ma spoke about bringing business to Malaysia, his role as the Malaysian Government’s digital economy adviser, the Digital Free Trade Zone and his electronic world trade platform initiative. Here is the full press conference of what happened that day.